The Two Puddings Pub, Stratford. The Scariest Film You Have Ever Seen. For more details, please refer to the sub-sections describing individual school journeys. 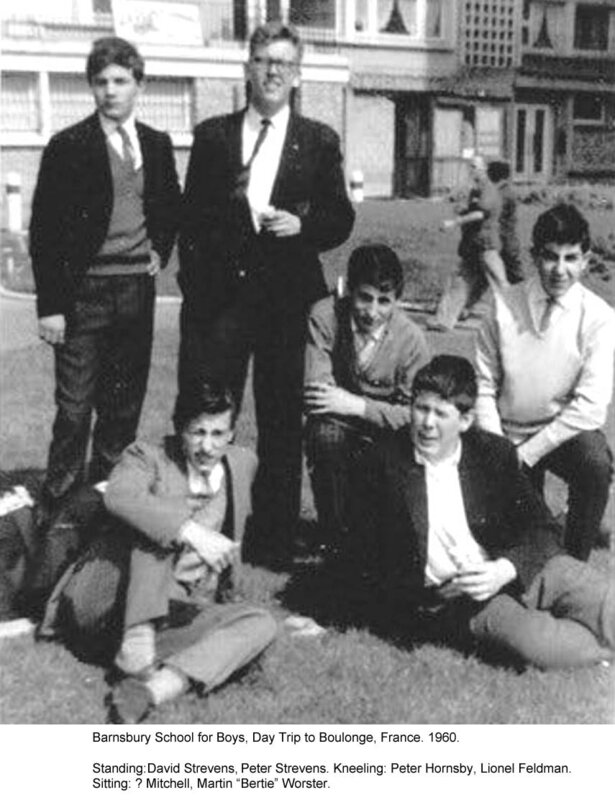 Roger in Australia recently mentioned a school journey to Innsbruck, Austria, somewhere around 1960. I replied that I had no idea that we ever went there. Can anyone shed light on this one - or on any others (two-week or channel hops)? 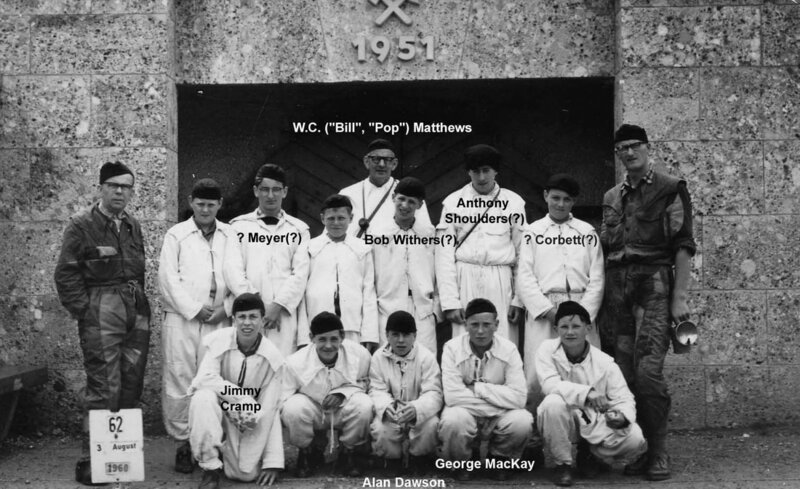 I know of Champery, Switzerland 1962 & 63. I also know of Lloret de Mar, Spain, in 1963. If you went then send me some stories, they bear repeating. Yes, the school did go there because David Gardner went on the trip and he brought me a present back, a knife called a skidon. This is probably also to Zell-am-See, Tyrol. Michael Stewart will know all the details. I recall going on the Easter 1962 School trip to Germany, as in the Magazine ( Summer 1962 ). I can't remember most of the names of the lads who went, but still have fond memories of the trip itself. However the comment of a short encounter with customs was not in fact correct, it was quite a long one as several lads...no names no pack drill, brought back flick knives and one lad a bow with some arrows. Oh happy days. The trip to Innsbruck was by train all the way. We changed trains in Basel. There I remember all the boys sitting down to eat a meal, it could have been at the railway station. A great journey. I think we all stayed together in a youth hostel which was very close to the River Inn. There was a wooden bridge nearby. It could be some other schools were there too. We had quite a lot of freedom to roam the city. There was one incident where we had to stay on the train at a border, something to do with passports? We were then declared undesirable aliens. The incident at the border. Could this be the famous flick knife/bow and arrow incident? Both Dave Brearey and Roger Ruthen mention it. It could have been, not sure. I do remember the teachers disappearing for what seemed like ages. It may have been at the Italian border, this is where my memory stops with this one. How things change in a couple of years. Nice to hear about your school trips into Europe in the 60s. Nearest I got to going across the water was on a ferry to the Isle of Wight in June, 1958, with Mr. Richards and Mr. Ley. One of the extracurricular activities available was the school journey; often two weeks taken during the summer recess. The destinations varied from the Isle of Wight to European resorts such as Zell-am-See in Austria, Champéry in Switzerland, Lloret de Mar in Spain, and the Rhineland in Germany. There were also one-day excursions and one in 1961 that was affordable to my parents was a trip to Boulogne-sur-Mer in Northern France. It was a popular journey involving many boys, teacher chaperones and even the Headmaster. Transportation was by train to Folkestone, Kent, then by cross-Channel ferry to Boulogne and return. At Boulogne, Phil Davies, Mike Stewart and myself kept together and eagerly explored the seaside town, amazed at the cultural differences and, at one point, practising our schoolboy French when buying ice cream cones. As we congregated for the England-bound ferry, many of the lads were accosted by quayside vendors, or “sharks” as we called them, selling all kinds of cheap trinkets. I recall one boy buying a flick-knife, but later decided it was too ‘dodgy’ to take through the Customs so he threw it overboard mid-Channel. The trip for me, however, sowed the seed for further interest in international travel (it was my first venture abroad – I believe we had one-day passports) and the following years were to see an escalation in this ambition. I remember going on a BB day trip to Boulogne in about ’62. The main thing we were interested in were Gauloise cigarettes, jumping jacks, petrol cigarette lighters and pen knives, all available to us in the ‘Tabac’ shop.. We had to wear BB caps to distinguish us and for the leaders to round us up, but as soon as we had spent our few francs on goods banned from 14 year old boys in the UK, we just went to the funfair to try to have a fight with the local boys. On second thoughts I do know why UK is more strict. These days we call it the ‘Nanny State’. I used to call it the ‘Mummy State’. My dear ol’ Ma (God rest her) was a teacher and Sunday School teacher. She brought me and my Sister up very well in a very Christian household. In Newington Green I was the only boy with a cowboy outfit – but No Gun. I wasn’t allowed toy guns, bows and arrows, pen knives or any other implements that could cause harm. I wasn’t even allowed to use a can opener till I was eleven. When I was about twelve my Mum took my Sister to Switzerland for an 18th birthday treat. I thought maybe I’ll get a Swiss Army Knife as a present. Mum bought me back a f***ing cuckoo clock. On the whole I think if there were more cuckoo clocks than knives and guns, the world would be a safer place. I have been frantically searching my memory banks about school holidays and found that I am nearly bankrupt and in dire need of a loan. I have hazy memories of what I think was Austria. Royston Score (built like a bulldozer) kept coming into our room at the pension Barnsbury Boys were dumped in, and jumping on the bed. One day he went over the top and crash landed the bed. The owner came rushing up from below and burst into the room. With his tiny tash and military hairstyle he was the dead ringer for Hitler! He could have been a clone (send in the clones) and jumped up and down gesticulating all the while. The teachers had to deal with it. Was Martyn one of the teachers or was it Graham? Perhaps they ignored Basil Fawlty's advice and mentioned the War. I remember you telling me the tale of Royston Score leaping on the beds. It's unlikely that even the most robust of the Gasthof sleeping furniture would resist Roy's weight. That's the word; a Gasthof. Sounds sinister to me, the German word for a hotel. Has echoes of Auschwitz and the gas chambers. That's what I thought at the time and that loony Hitler clone didn't put my mind to rest. Have you seen 'The Boys From Brazil' ? They get his DNA and breed or grow multiple Adolfs. Scary. When Takis and about thirty other boys arrived in Switzerland on that first day, there wasn't any snow and they were all worried that they would not be able to do any skiing. However, when they woke up the next morning and looked out of the window they saw that it had snowed heavily during the night and was over a metre deep. The first day on the slopes, Takis was showing off as always, looking at the expert skiers doing a "stop Christies," which when done properly, should halt the skier. Takis tried to copy the experts and found himself in a heap, with his right ankle wrenched and he was brought down the mountain in a sledge, pulled by an expert skier at fifty miles an hour, head first. That was the end of what would have been a brilliant skiing career. He spent the next two weeks visiting Mr. Bone in the local hospital. On the 25th July, 1961, one hundred and forty-six boys from the Camden Road building boarded a train at Victoria Station at 7:30 a.m., and we could not have had a better day for our trip. As I sat in a compartment with some friends, the sun shining through the window, I thought to myself what an enormous job of organising it had been, a job that was so efficiently done by our two French masters, Mr. Williams and Mr. Meyer. The preparations had begun about two month previously, when all names had to be collected in and money had to be paid, etc. As the weeks passed by, the boys' excitement mounted until at last, the day came. We had to meet together at Victoria and report to our masters in charge, at 7:15 a.m. At 7:30 a.m. we boarded the train, and waited until 7:58 for our departure. As the train slowly pulled away, some boys tried to catch up on some lost sleep, whilst others attempted to read the morning newspapers, but most found it almost impossible, because of their excitement. The party arrived at Folkestone a 9:50, went through the passport check, and boarded the ship, which left at 10:30. We were left to roam about the ship as we pleased, and most of the boys wandered around, or sat on deck. At about non, we disembarked, went through passport check and then we were at liberty to do what we wished. We had, however, strict instructions to be back on the boat by 5 p.m., because if any of us were not, nobody would wait. The majority of the boys went with friends in small groups. There were many places that could be visited; the museum, the Cathedral, the old and new parts of the town. Also trips could be taken by 'bus to a nearby fishing village. Those of us who stayed in the town, walked about and looked at the shops, but wherever we went, we were plagued by little men carrying baskets full of trinkets, souvenirs, watches, and even table-cloths; they were trying to unload some of their goods on to us. Some boys tried out their knowledge of the French language on the local inhabitants, only to meet some difficulty in the speed at which the latter spoke. The only reply that many received was a wide-eyed look of astonishment. It was a blistering hot day, so many of us found ourselves creeping into the shade on the many cafés that are to be found in the town. If by any chance, any of us had seen all there was to see, we could have sat on the beach and surveyed the view. The only trouble was that the time passed by so quickly, that before any of us knew it, it was time to make our way back to the boat. The journey home was uneventful, the only thing different being that, at Folkestone, we had to go through the Customs. The train slowly came to a halt at Victoria at abut 9:20. Everybody said good-night to one another, and we all made our way to our different homes. I am sure that the journey was enjoyed by everyone, and most of us would not hesitate to go again. The one thing that might have spoilt it, after a most enjoyable day, was the thought of school next morning, looming over our heads. We talked some time ago about the ‘Adventure Course’ held at Marchants Hill. JP and our dear friend Peter Stechman had talked about attending. I said I also attended but couldn’t remember the year. Well, sorting through some photos last night I found my certificate carefully hidden in a photo album which hadn’t been opened for years. Up every day at 7.00; jump into the freezing outdoor pool, hot shower, change into warm outdoor clothes before a breakfast of lumpy porridge and full English. Then back to barracks – sorry dormitories, before a full day of PT, hiking, obstacle courses, cross country running, lessons on map reading, compass work, orienteering. All better than school but hard work. The whole purpose of the course was to toughen up us London urchins. One of the trainers was a certain Mr Richards, and he wasn’t the toughest by far. We hiked over the Devils Punch Bowl, through gorse bushes. We were loaned LCC supplied waterproofs – Black's cagoules and over-trousers, Black's tents and Black's sleeping bags and very good they were too – except that the gorse could pierce the waterproof outer, and then the rain would come in. After the three weeks the piece-de-resistance was a three day hike. We were split into pairs; can’t remember the name of my partner;. Each pair was given an Ordnance Survey map with one 1 inch x 1 inch square cut out. 1 inch on the map represents 1 mile, so we all had a different square missing. The idea being each pair would be dropped off in the coach and told to make their way to their missing square; approx. three days hike away; and then survey that area and make a map of the area using their compasses, pacing out distances, marking prominent points such as churches, stations etc. En route we had to note in our notebooks any prominent points of interest; such as signposts, war memorials, names of farms etc; to prove we had been there. We were also given letters of introduction so we could call at farms to ask to pitch our tent. It was freezing, and both farms that we called at allowed us to sleep in the barn and provided us with eggs and milk in the morning. Our final destination was a village called ‘Isington’ near Alton in Hampshire. We had to knock on the door and talk to the owner, and find out who he/she was. I’m sure all the other pairs had the same instructions, but ours certainly was interesting. I guy about my Dad’s age, 55 or so, answered the door - he had probably been warned by the LCC organisers, invited us into the kitchen to have tea and biscuits. We asked who he was and how he came to be there. It was obviously not his house, but he explained he was the housekeeper and that his guv’nor was not at home today because he was 'up London on official business'. The Guv’nor was none other than Field Marshal Bernard Montgomery (Monty). Our host that day was his housekeeper and valet and had been Monty’s batman during the war. After this brief encounter we made our way to our missing square. We started pacing the road, marking the change of directions of lanes to either side using our compasses, when all at once we came to a crossroads and found four other boys doing exactly what we were doing. We sat in a wooden bus shelter; from where we were due to be collected an hour or two later. There was a pub at this crossroads, and we could see signs of life; by this time it was mid morning on the third day. We went over to the pub and asked the man if there were any jobs we could do. He got us to clear out the two fire places, chop wood and light the fires. When we had done that he let us sit in the pub by the fire until the bus came. He gave us hot soup and crusty bread, we also had a crafty game of darts. We took the opportunity of copying each others maps to finish our squares. The bus picked us up at about 2.00pm, and we all had a good laugh at the other boys who were freezing, and we were nice and warm. So my certificate states ‘that he performed the tests and tasks assigned to him and that he successfully completed the course’. It certainly taught us to be self-sufficient and confident.